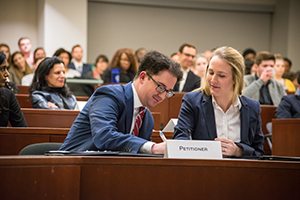 Peter Cornick ’20 and Elizabeth Holden ’20 won the 2019 Bass Berry & Sims Moot Court Competition, held at Vanderbilt Law School Feb. 1, receiving the John A. Cortner Award and a cash prize for their win. Cornick and Holden faced finalists Joline Desruisseuax ’20 and Braden Morell ’20. The competition began last fall with 62 teams and a total of 123 participants. Dora Duru ’20 received the Richard Nagareda Award for Best Oralist, and the team of Natalie Komrovsky ’20 and Rachel Miklaszewski ’20 received the award for Best Brief. Semi-finalists included Charlotte Gill, Dora Duru, Carlie Malone and Shiva Mohan, all Class of 2020. 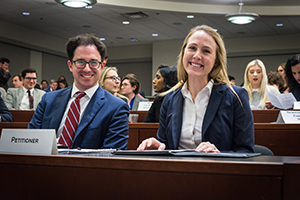 Under the leadership of Vanderbilt Moot Court Board Chief Justice Natalie Pike ’19, Executive Justice Ahsin Azim ’19 managed a team of third-year students who organized and ran the competition. 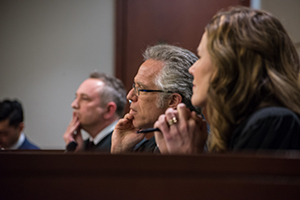 The competition’s final round was argued before a panel of three federal appellate judges, including Judge Stephen A. Higginson of the U.S. Court of Appeals for the Fifth Circuit, who served as the round’s Chief Justice, Judge David J. Barron of the U.S. Court of Appeals for the First Circuit, and Judge Amy Coney Barrett of the U.S. Court of Appeals for the Seventh Circuit. Whether the Fourteenth Amendment prohibits the use of a peremptory challenge against a juror based solely on that juror’s sexual orientation. The problem, written by executive problem editor Caroline Barnett ’19 and associate problem editors Sam Heller ’19 and Ian Joyce ’19, followed the appeal of West Hugo v. Burgundy. Jean Burgundy, a gay activist who also worked for anti-gun and women’s rights groups, was convicted of violating the State of West Hugo’s concealed-carry restriction on handguns after a pistol was discovered in a backpack in his possession. Burgundy had been denied a concealed-carry permit by the State of West Hugo after state regulators determined that his fear for his personal safety as a gay activist did not meet its standard of “undeniable need” for concealed carry. He was sentenced to three years in prison for violating West Hugo’s concealed-carry statute. During voir dire in Burgundy’s case, two openly gay potential jurors were removed by peremptory challenges. Burgundy’s appeal before the Supreme Court addressed two issues: Whether the State of West Hugo’s requirement that an individual prove “undeniable need” for concealed carry of firearms before the state would grant a permit violated the Second Amendment, and whether the use of peremptory challenges to strike jurors on the basis of sexual orientation violated the Fourteenth Amendment. Cornick and Holden argued for the petitioner, Jean Burgundy, and Desruisseuax and Morell argued for the respondent, the State of West Hugo. The John A. Cortner Award, which goes to the winners of Vanderbilt’s annual Bass Berry & Sims Moot Court competition, honors John Cortner ’85, who served as the Moot Court Board’s chief justice. Cortner joined Bogle & Gates in Seattle after graduation, but was diagnosed with Hodgkin’s disease soon after and died within the year. His family endowed the award in 1988 in his memory.